Andrei Gritsan received his PhD in 2000 from the University of Colorado at Boulder. His primary research interests are in experimental particle physics. He is a member of a team of researchers at the Large Hadron Collider, who, in 2012, announced the discovery of a new subatomic particle, a Higgs boson. Prof. Gritsan's research is focussed on the observation and study of the new form of matter-energy, such as the Higgs boson. Together with his colleagues on the CMS experiment on the Large Hadron Collider, he worked on the Higgs boson discovery , study of its spin-parity quantum numbers [2, 3], measurement of its production mechanism and deeper understanding of its properties , constraints on the Higgs boson width [5, 6] and lifetime , comprehensive study of the Higgs boson quantum numbers and anomalous interactions [8, 9], and taking a number of these measurements to a new level with Run II data from LHC [10, 11, 12, 13, 14]. He worked with a group of experts to develop new methods (also known as MELA technique and JHU generator) [15, 16, 17, 18] for the angular and statistical analysis of the decay products and associated particles of the Higgs boson. Read more about this effort. All the above measurements point to the property of vacuum, which is filled with the all-penetrating Higgs field, where the boson is simply its excitation created in the laboratory (see also Nobel Prize Physics-2013). Our past, present, and future depend on the properties of this field, and we are still to understand all the implications of this grand discovery and to study in detail this new form of matter-energy never known before. However, it is likely that the discovered Higgs boson is just a tip of an iceberg of new states of matter-energy. The undiscovered symmetries of nature which unify the fundamental forces and particles, the puzzle of dark matter and energy, and the apparent lack of antimatter in our Universe, all these mysteries point to something new that could be uncovered at an unprecedented energy scale with the Large Hadron Collider. Prof. Gritsan's team also pursues both direct searches [19, 20, 21] for such new states and indirect constraints through precision measurements of the known states, such as the Higgs boson [1-18] and Z boson [22, 23, 24]. Prior to LHC, direct access to new fundamental particles (such as the Higgs boson or new states) was beyond the energy reach of operating accelerators. Gritsan worked with the heavy flavor quarks, such as the "beauty" or b quark, which were produced in electron-positron annihilations at the BABAR and CLEO experiments. He was looking for new ways to search for new fundamental particles that could exist briefly as heavy virtual states in the decays of b quarks. The Heisenberg uncertainty principle in quantum physics allows such non-trivial effects, called "penguin" loops, to occur for short instants. On CLEO, he discovered [25, 26] this process as part of his Ph.D. research. It was the first observation of the gluonic penguin transition b->s+gluon. On the BABAR experiment, he discovered  a surprisingly large transverse polarization of the vector mesons produced in a penguin decay, which contradicted all expectations and may become evidence for new particles and interactions, and took this approach of angular analysis to a new level [28, 29, 30, 31]. Another important aspect of heavy quark decays is that they include the only known example of Charge-Parity (CP) reversal symmetry violation, which is equivalent to Time-reversal symmetry violation and which follows from the Cabibbo-Kobayashi-Maskawa (CKM) quark-mixing model (see also Nobel Prize Physics-2008). CP violation is necessary to produce our matter-dominated Universe and has important cosmological consequences. The Standard Model mechanism that leads to CP violation is represented graphically by the so-called "Unitarity Triangle." On the BABAR experiment, Gritsan discovered the B decays to two rho mesons, showing that an analysis of this system could determine one of the angles alpha of the "Triangle" precisely by constraining penguin effects [32, 33, 34]. Prof. Gritsan is also an expert on various aspects of high-energy physics detectors, such as silicon tracking detectors, electromagnetic calorimeters, tracking drift chambers, triggers. He had been leading the tracking and silicon detector alignment groups at the BARAR and CMS experiments [35, 36]. An essential element of the LHC program is the alignment of thousands of silicon detectors that track the particles' paths which must be understood to micron precision. Prof. Gritsan led the CMS team to successful commissioning of its silicon tracker alignment at the time of data-taking startup  and was an editor of the very first CMS publication . Further references may be found in . We communicate our research results to the public through outreach activities. We develop these activities through the QuarkNet program, annual Johns Hopkins Physics Fair, Science Festivals, and collaboration with the Maryland Science Center, as well as through hands-on demonstrations of elementary particles on the university site. There are exciting opportunities for graduate and undergraduate students to work in collaboration with experts to create new exhibits to communicate Particle Physics to the public. We also invite teachers and students from schools in Baltimore area to participate in these activities. Contact Prof. Gritsan and other faculty members for further information. 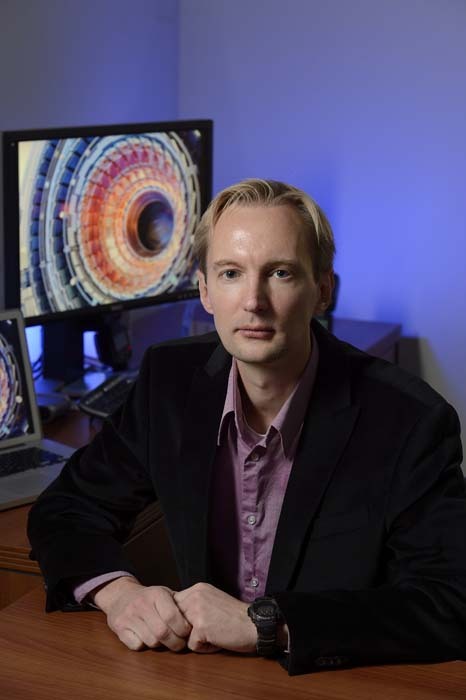 Read an article " Hadron collisions reach out to people in Washington" in CMS Times. We have developed an exhibit devoted to the Large Hadron Collider which was shown in Washington DC during the Science and Engineering Festivals in October 2010, April 2012, April 2014, April 2016, and April 2018. We are preparing for the next Festival in April 2020. This exhibit highlights the particle physics and the LHC results in particular. Graduate and undergraduate students work with Prof. Gritsan on exhibit development. Read more in the CMS Times article and check these slides. We invite student volunteers to help with development and/or presentation of the exhibit, contact Prof. Gritsan for further information. The Johns Hopkins Physics Fair attracts several hundred visitors from Baltimore area each Spring. We provide continuous physics demonstrations, prepare science exhibits (see more on the Science Festival exhibit below) and conduct competitions for local high school students. This became a popular event on JHU campus and we invite everybody to participate in the next Physics Fair in the Spring. We have a hands-on demonstration of elementary particles in the Cloud Chamber. We also have an illustration with an array of scintillator counters which would register cosmic rays and would be integrated in the US-wide array of cosmic counters located in the high schools. Information about the JHU Undergraduate School in Physics and Astronomy. There are exciting opportunities for undergraduate students of all levels to participate in Experimental Particle Physics research. Contact Prof. Gritsan for further details. There is an option of conducting research for academic credit. Provost's Undergraduate Research Award or Dean's Undergraduate Research Award are excellent opportunities to conduct research projects. Recently three students who worked with Prof. Gritsan received the awards: Manisha Narayanan, an undergraduate student at JHU, was awarded the Provost's Undergraduate Research Award in the 2010-2011 academic years (see the article " Hadron collisions reach out to people in Washington" in CMS Times); Heshy Roskes, an undergraduate student at JHU, was awarded the Dean's Undergraduate Research Award in the 2013-2014 academic years (see the article " Heshy Roskes ’14: Smashing Particles" in JHU Arts and Sciences magazine); and Jered McInerney, an undergraduate student at JHU, was awarded the Provost's Undergraduate Research Award in the 2016-2017 academic years. The projects are to learn and apply data analysis techniques on the CMS high-energy physics experiment on the Large Hadron Collider (LHC) or/and to develop outreach projects which communicate LHC results to the public. Technical aspects of the data analysis work involve modern computer applications in high energy physics. Some experience with modern computer languages and operating systems (e.g. UNIX/C++) is desired but not required. See discussion of the projects for the graduate students. Information about the JHU Graduate School in Physics and Astronomy. An overview of research activities is given here. Learn physics analysis techniques in frontier particle physics and work with silicon tracking detectors. Some experience with some of the above items (UNIX/C++) is desired. Course in Elementary Particle Physics (171.625) is recommended but not required. You can read more about the CMS experiment.